It was during Thanksgiving dinner that I started thinking of holiday flavors. 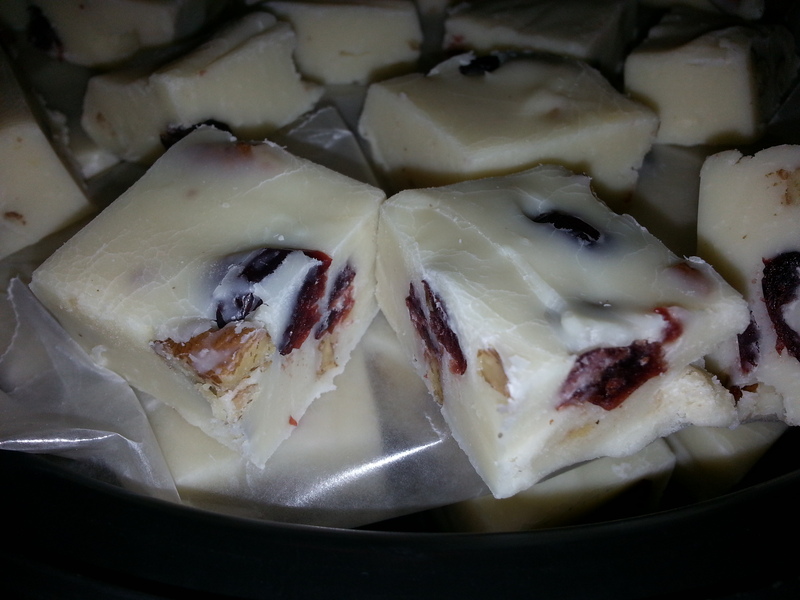 I realized that I really liked the idea of a white chocolate fudge with cranberries and pecans. It was as I was eating a breakfast muffin that I realized that this proposed combination needed some orange flavor. Did you guess that it was an orange cranberry muffin? So I began by melting white chocolate chips in sweetened condensed milk. Once it was melted and I was able to stir it together to a smooth consistency, I added some dried cranberries, chopped pecans, and 8 drops of doTerra wild orange essential oil and stirred it again. The fudge was then poured into a 8X11″ pan that was lined with wax paper. After it cooled, it was cut into squares and placed in a covered container with wax paper between the layers. The result was better than I had imagined. Even Baker’s Man who had originally been skeptical about this combination liked it. In fact, it was the first type of fudge to disappear. Here’s your recipe. Give it a try. You’ll be very glad you did. Thanks for visiting Patty Cake’s Pantry. This is a variation of Patty Cake's Famous 5 minute fudge. The combination of flavors is delicious. Line an 8 X 11, 8 X 8, or 9 X 5 inch pan with waxed paper. The smaller the pan, the thicker the fudge will be. Pour white chocolate chips into microwave safe bowl. Pour the can of sweetened condensed milk over the chocolate chips making sure that you scrape all of the milk into the bowl. Remove from microwave and stir well, checking to ensure that the chocolate is fully melted and the consistency smooth. If it is not smooth, return the bowl to the microwave for an additional minute or two, removing it from microwave and stirring after each 30 seconds. Add the dried cranberries, chopped pecans, and orange essential oil. Stir vigorously and pour into the paper lined pan, using the back of a spoon or a flexible spatula to smooth the surface of the fudge. Allow to come to room temperature and set up (become firm). Cut into 1 - 2" squares and place into an airtight container, using waxed paper between the layers. Nutrition Facts are for a portion size of 1/16th of the entire recipe. Love homemade fudge. Reminds me of the fudge my grandfather used to make! My mother always made homemade fudge for Christmas, but she didn’t use white chocolate. 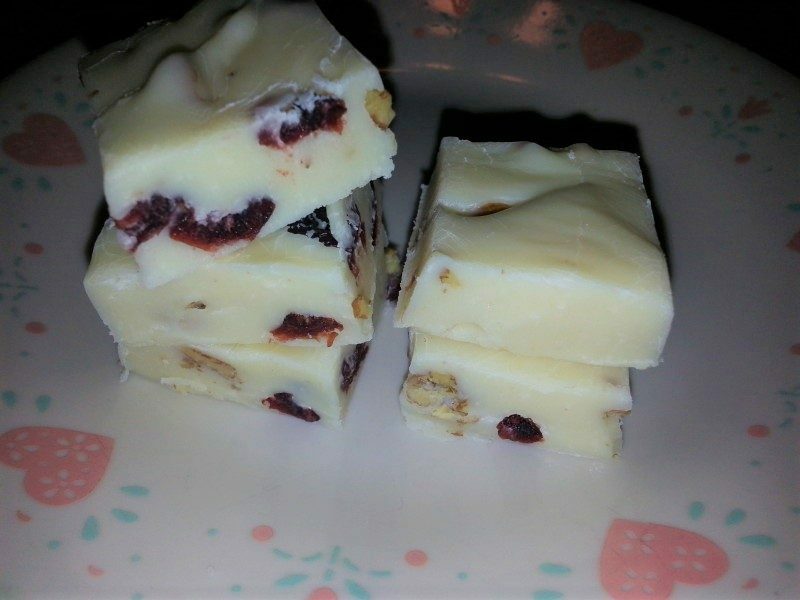 Cranberries and pecans are such a fun addition for a holiday fudge! The splashes of red are so festive! Yes, I agree that the red is festive, and I really love the combination of cranberries and pecans for Christmas. The orange oil really takes this from good to great.